Even those who seem to be totally dedicated to their jobs have unproductive periods during their working day. Whether they are sitting typing like their lives depended on it trying to look busy or are over extending the length a task should take everyone does it and you know the boss knows it goes on as they did exactly the same when they were in your position, but you still don't want them to catch you at it. A great way to relieve the boredom when you are in one of your unproductive stage is to send a few business ecards around the office via email and watch your colleagues frown at first when they see the email from you then try their hardest to stifle their life when they see what you have sent them. The silhouette of someone sitting at their computer against a turquoise background in the image on this Unproductive ecard. 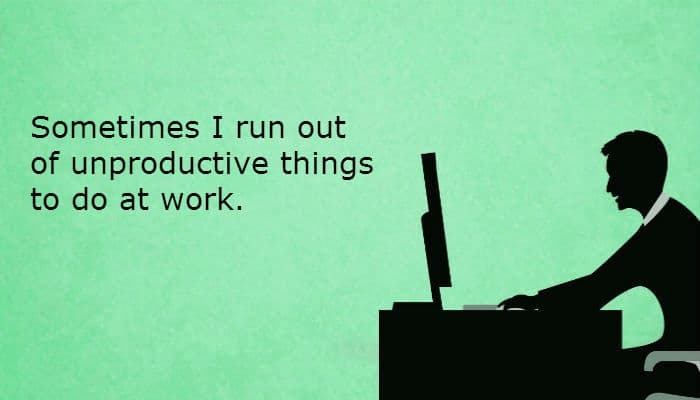 The text across the top reads; Sometimes I run out of unproductive things to do at work”. Workplace humour at its best as everyone will know what it means instantly and none of you want the boss to catch on to your grown up and technologically improved way of passing notes around a class room. Are you also responsible in any way for your business Christmas holiday marketing? If so we would love you to pop over and have a look at our holiday ecards for business.